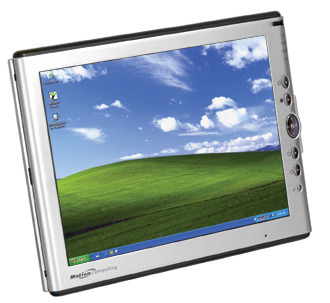 The Motion M1200 is an ultra-mobile Pure Tablet PC designed to work the way you do! Input, search, edit, highlight or find/replace in your current applications using a keyboard OR the pen. Take notes in meetings, enter client information or send an email. Your emails can even be sent in your own handwriting. With the built-in wireless feature, you can search the web, check for updates or sales information in your company database anytime, anywhere. Invite others into a private adhoc network to discuss and edit a customized presentation online minutes before meeting with a client. Your options are now endless. With all this functionality at less than 3 lbs. and sporting a rugged magnesium structure, you will want to take the Motion M1200 with you everywhere!